Seiko watches: Presage, Prospex, Astron or Sportura - which Seiko collection do you find irresistible? In 1969 Seiko developed the world's first quartz wristwatch. The Quartz Astron. Since then, the watch manufacturer from Japan has inspired watch fans all over the world with groundbreaking innovations and high quality standards. All Seiko automatic » and quartz watches », whether chronographs, diving watches or other types of watches, are characterized by precise movements, a perfect design and innovative functions and are considered perfect mechanical products of traditional watchmaking art. If you hold a Seiko wristwatch in your hand for the first time, you will recognize it immediately: The watch radiates perfection. This picture is conveyed by all Seiko watches. When 21-year-old Kinato Hattori, founder of Seiko, opened a watch repair shop in Tokyo in 1881, he probably had no idea that he would go down in history as a pioneer of watchmaking. Seiko launched the world's first quartz wristwatch in 1969, five years after Seiko's stopwatches were used as timepieces at the Tokyo Olympics. Since then, the traditional watch manufacturer has been the official timekeeper at numerous sporting events. Today, Kinato's great-grandson Shinji Hattori runs the company. The pursuit of perfection is his corporate philosophy, as it was for his great-grandfather. Whether mechanical watch, quartz watch, Kinetic watch or Spring Drive: Every Seiko watch radiates perfection. Seiko launched its first Spring Drive watch in 1999. In this watch, the mainspring is the only source of energy. It transmits power to the hands and to the Tri-Synchro regulation system, which uses an electromagnetic force pulse to control the speed of the gliding wheel and the hands. Precision, reliability and durability are the hallmarks of Spring Drive technology. Environmentally friendly and sustainable production is particularly important to the Japanese watchmaker, and here, too, he plays a pioneering role. Seiko was the first watchmaker to use mercury-free batteries and stopped using the climate-damaging gas CFCs in its production at an early stage. Always one step ahead, both in watch technology and in environmental issues - that is Seiko's motto. 1969 First quartz wristwatch in the world: Seiko Quartz Astron. 1973 First LCD quartz clock with 6-digit digital display worldwide. 1975 The world's first digital multifunction watch. 1982 First TV watch worldwide. 1983 The world's first watch including a sound recording function. World's first quartz wristwatch with analog display and a Seiko chronograph. 1984 First watch with computer functions worldwide. 1988 The world's first quartz wristwatch with automatic power generation (A.G.S.) - was later renamed "Kinetic". First intelligent quartz wristwatch with analog display worldwide, controlled by a CPU-IC. 1990 First computer-controlled diving watch worldwide: "Scubamaster". 1991 First watch worldwide with a perpetual calendar that reaches into the next millennium. 1998 First watch in the world with a perpetual calendar driven by the world's smallest ultrasonic motor. First watch in the world to be powered by body heat: Seiko Thermic. 1999 First Spring Drive watch worldwide. 2005 First 3-band radio controlled clock worldwide. 2006 First watch worldwide with electrophoretic display, "Spectrum". 2007 First Spring Drive Chronograph in the world to measure stop time with sliding hands. 2008 The first watch in the world designed specifically for use in space: Spring Drive Spacewalk. 2010 First EPD watch with active matrix system worldwide. 2012 First GPS solar clock worldwide: Seiko Astron. Considers all 39 time zones of the earth. Seiko Astron: The first GPS solar clock worldwide. There is a lot to tell about Seiko products and the functional specifications tempt you to get carried away with the technical features. Especially since Japanese customers interested in inexpensive yet high-quality watches » are served in the same way as those interested in luxury watches ». With the following explanations we would like to help you to gain a rough overview of the product range and to find the right watch type. ... GPS controlled adjustment to your time zone. Once a day, each Astron GPS Solar automatically receives the time signal from multiple GPS satellites or connects to them at the touch of a button. Via GPS, the clock recognizes its exact position, time zone and time. The hands are set to local time automatically and with the accuracy of an atomic clock. 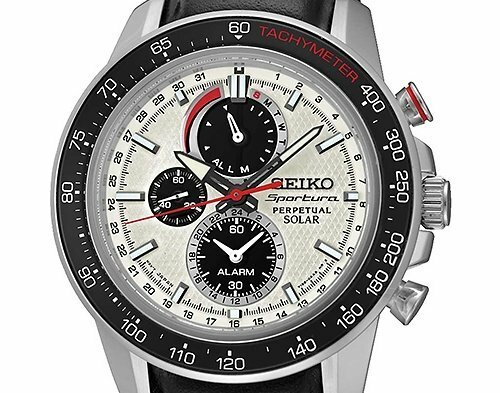 Watch lovers and globetrotters appreciate the practical advantages of Seiko GPS Solar Technology. Also the unique Astron design inspires watch fans worldwide. Astron models are equipped with different calibers. Since the Astron was first introduced, Seiko has expanded and advanced the range of GPS solar calibres so that the Astron collection now includes chronographs, watches with a second time zone, watches with a large date or with world time. With the introduction of the new caliber 5X, Seiko has started a new chapter in the history of GPS solar technology: With a diameter of only 42.9 mm and a height of only 12.2 mm, the new Astron 5X series (currently) is the world's smallest and thinnest GPS solar watch. The fast and intuitive operation of the 5X caliber reduces the time difference between Tokyo and New York to just three seconds. New features also allow the main dial to switch instantly from home to local time and vice versa. The wristband can be quickly adjusted to fit the circumference of the wrist by fine adjustment of the strap. The watch therefore always sits perfectly on the wrist of its wearer, even at different temperatures. ... run without battery and protect the environment. Seiko automatic watches include mechanical wristwatches in which the movement of the arm winds up the spring of the watch by means of a rotor and the timepiece thus functions. Unlike manual winding, automatic watches run more evenly. Automatic movement - Thanks to the Magic Lever invented by Seiko, the watches have a highly efficient automatic winding system. The wearer also has the option of supplying his watch with energy via the crown. Day & date display one window - in 1963 it was not yet a matter of course that day and date were presented in a single window. Seiko used the idea for the Seiko 5 to make the dial as legible as possible and developed a system that could display both the date and the day on one level. Water resistance: at least 3 bar - Seiko 5 watches can withstand contact with water. A water resistance of 3 bar is standard for this collection. Shock resistance - Seiko 5 watches feature the Diashock system, which protects movement parts from shocks. The mainspring is made of the unbreakable alloy "Diaflex". Durable Case & Bracelet - In addition to being water resistant, Seiko 5 watches are resistant to sweat and water because the case and bracelets are made of stainless steel or other durable materials. ... transforms kinetic energy into electrical energy. Seiko has been developing different Kinetic watches for more than 20 years. 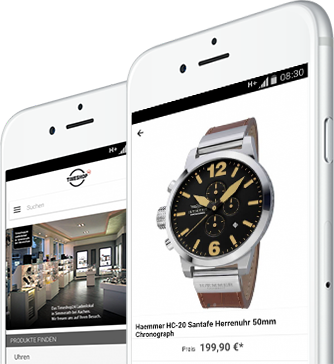 Just like mechanics and quartz, Kinetic is a technology platform. The term "Kinetic" describes a movement that converts kinetic energy into electrical energy. Over time, Kinetic has become synonymous with environmental friendliness, durability and high performance. Each of these movements offers specific functions and characteristics. 1998 Seiko launched the Kinetic Auto Relay, a watch with a power reserve of four years. 1999 the Ultimate Kinetic Chronograph was introduced - a masterpiece that combines Seiko's best mechanical and electronic skills in watchmaking. 2005 at Baselworld 2005 Seiko presented the Kinetic Perpetual with a perpetual calendar until 2100. 2007 Kinetic Direct Drive was introduced as the embodiment of Seiko's emotional technology. Like all Kinetic watches, Kinetic Direct Drive watches generate electrical energy from the wearer's arm movements, but can also generate energy by manually turning the crown. A special element on the dial allows you to read off the residual energy as well as the level of energy generated during manual winding. The energy transfer can thus be observed in real time during manual winding. ... Kinetic watches with classic design elements. The collection of Seiko Premier watches includes quartz and mechanical calibres. The Premier collection is characterized by the use of the exceptional Seiko Kinetic Direct Drive caliber. Seiko has been developing various Kinetic movements for over 20 years. Each of these movements provides the wearer with specific characteristics and functions. Kinetic Direct Drive, for example, describes an innovative technology that enables energy to be transmitted in real time through the wearer's own body movements. As with all Kinetic watches, the arm movement of the wearer automatically generates electrical energy. Kinetic Direct Drive offers the wearer the additional option of generating energy by turning the crown. In addition to the residual energy, the display of the watches shows the energy level generated by the manual winding process. This means that Kinetic Direct Drive creates a direct interaction between the wearer and the watch by allowing the wearer to observe the energy transfer in real time during the manual winding process. The design of the Premier watches is characterized by the use of design elements of classical architecture and the world of Art Deco. Seiko men's watches of the Premier collection convince by a special elegance, the Seiko ladies' watches of the Premier collection draw from these design elements a particularly feminine character. ... finest mechanical clock production from Japan. The Presage collection includes an extensive range of calibres, such as the inexpensive 4R calibre », the 6R calibre » and the exclusive 8R calibre ». Seiko develops and builds all calibres itself, so Presage watches have the potential to last for generations. Spron - All Seiko mechanical watches exclusively use Spron alloy for main and balance springs. Spron is characterized by maximum elasticity, resilience, resistance to corrosion and heat. Diashock - In 1958 Seiko developed its own shock protection system. This protection serves to absorb shocks and vibrations that a watch experiences when it falls to the ground, for example, and which usually damage balance components, especially the balance axle. By means of a diashock, the jewel is connected to a spring to support the axis of the balance, the elasticity of which absorbs vibrations. Magic Lever - In 1959 Seiko increased the winding efficiency of a wristwatch, shortening the time to complete winding. Magic Lever is a V-shaped lift that allows all movements of the flywheel mass to be transformed into a direction of rotation to wind the mainspring. The ingenious thing about this is that the flywheel mass can be moved both clockwise and counterclockwise. ... High performance watches for high performance sports. Prospex diving watches from Seiko, as do the different calibers and specifications. The solar chronographs, automatic models or solar diving watches of the Japanese watch manufacturer are 20 bar water resistant, pushers, crown and case back screwed. Large arrow hands and indices with LumiBrite luminous coating, some of which are framed in colour, ensure good legibility. The unidirectional rotating bezels are easy to operate thanks to the ribbing and fixed silicone bracelets ensure a secure fit on the diver's wrist. Prospex models have power reserves of up to six months, stop functions of up to 60 minutes in 1/5 second increments, an intermediate time measurement and a small second. When fully charged, some models display the correct time for up to 10 months. 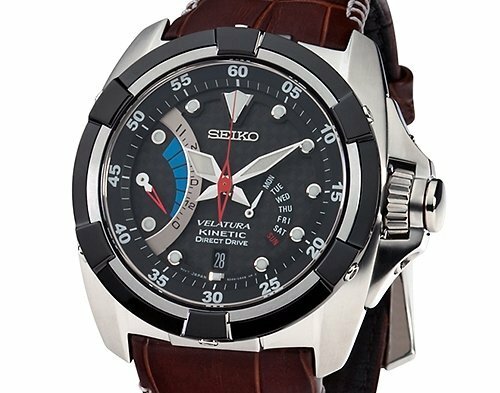 The automatic models have a very high winding efficiency, thanks to the "Magic Lever" winding system developed by Seiko. … function and shine thanks to the sun's rays. A light source charges the watch's energy store via a solar cell unit and the watch's dial is additionally charged via the light source so that it shines clearly in the dark. The time that a solar watch runs until it needs to be recharged (power reserve) is between two and ten months, depending on the model. Seiko, the watch pioneer, was involved at a very early stage in the development of new technologies that made battery-free operation of wristwatches possible through alternative energy generation. In 1988, for example, the Japanese watch manufacturer launched Seiko Kinetic, which is powered by kinetic energy. Ten years later, the Seiko Thermic followed, which works thanks to body heat. 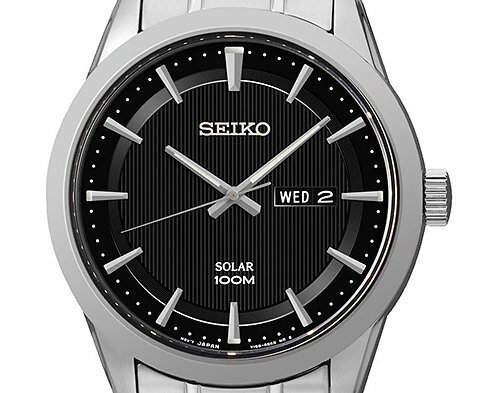 Seiko Solar rounds off this battery-free series. We can look forward to the next innovative developments. … sporty high performance combined with technical precision. Seikos Sportura chronographs as well as Seikos brand ambassador Novak Djokovic set sporting standards. The wristwatches of the Sportura collection prove their worth in sports timekeeping, thanks to the wealth of experience Seiko has gathered during his long company history. Sportura chronographs feature easy-to-use push buttons, a tachymeter scale and a stop function in 1/5 second increments. 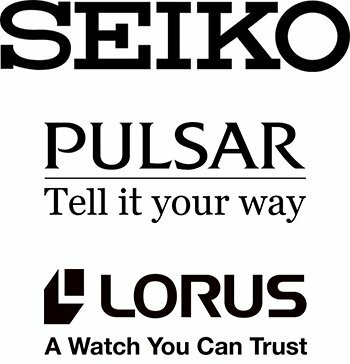 Seiko Germany distributes other brands in which Seiko movements are used: Grand Seiko, Seiko Astron, Seiko Clocks, Pulsar, Lorus and Global Site. Whichever brand you choose in the Timeshop24 Watch Shop, Seiko, Pulsar » or Lorus », you will receive a high-quality piece of Japanese watchmaking art - and if you buy your wristwatch in our watch shop, you will receive your new watch from an official concessionaire and can also conveniently pay on account.